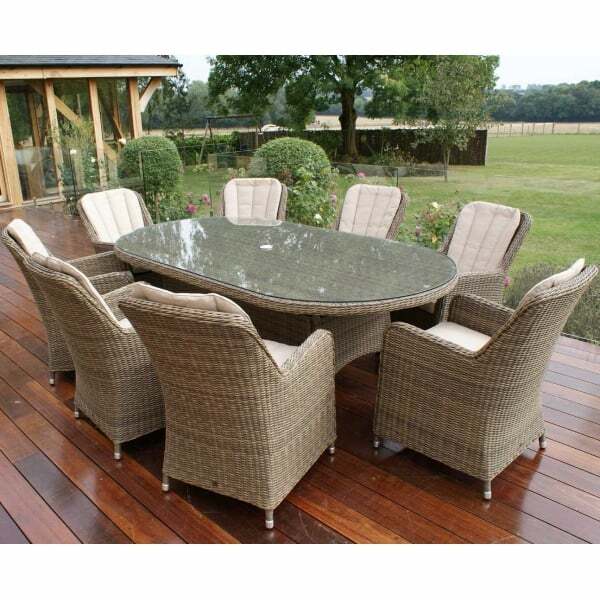 This stunning 8 seater dining set from the Maze Rattan Winchester range is perfect set for those large dining occasions. The attractive chairs feature round rattan weave and include padded seat and back cushions providing comfort and support. The large oval table is stylish and versatile and has an easy clean glass top. The synthetic rattan is weatherproof and easy to maintain, therefore this dining set can be used not only indoors but also outside on the patio or in the garden. Any stains can be removed using warm water and mild detergent. This 8 seater rattan set has a rust resisting aluminium frame and comes with a 1 year manufacturer’s warranty. Other products from the comprehensive Maze Rattan Winchester range can be viewed on our site.